Click each student’s name below to find out more information. Click the name again to hide their information. Paul Agenten was born to Douglas and Gloria Agenten and raised in rural Goodhue, Minnesota. He attended St. Johns Lutheran Grade School, Goodhue Public High School, and received a Bachelor of Arts degree in Liberal Arts from Bethany Lutheran College in Mankato, Minnesota in May of 2003. At Bethany College, Paul studied music, social science, and business while remaining actively engaged in concert band, choir, and student senate. Paul was selected to be a resident assistant for two years and was also a tour guide for incoming students. After graduation he relocated to Bozeman, Montana where he lived for twelve years and was employed there by Wells Fargo Bank, Bozeman Deaconess Hospital, and eventually Johns Manville, a Berkshire Hathaway company for nine years as a parts and equipment technical representative. In 2016, Paul moved his wife Courtney and daughter Hallie back to Bethany Lutheran College to prepare for 2018 entry into Bethany Lutheran Theological Seminary. Currently, Paul is a junior at BLTS, and he and his wife are Resident Hall Managers for Edgewood Place on the Bethany College campus. Paul has also been a part time evening supervisor at the UPS facility in North Mankato for the past year. Outside of work Paul is an avid runner and cyclist, and immensely enjoys the blessings of being a husband and father. Finally, the Agentens are soon expecting to be a family of four! Colin Anderson was born to Thomas and Katherine Anderson and raised in Faribault, Minnesota. He attended Faribault High School, Bethany Lutheran College, Minnesota State University Mankato, and Martin Luther College. He studied Special Education and graduated with a Bachelor of Science in Education in May 2014. At Bethany he was active in choir and golf and various intramurals. After graduating college he was a Special Education teacher for two years in the Mankato Public School District. He was also a basketball coach at Mankato East High School for three years. He enrolled at Bethany Lutheran Theological Seminary in 2018. Currently he works as the Resident Hall Coordinator of Gullixson Hall at Bethany Lutheran College. He also works part-time as a bartender at a local restaurant in Mankato. Outside of study and work he spends time with his family in Faribault and also enjoys golfing, hunting, fishing, exercising and other outdoor activities. Peter S. Bockoven was born to Peter M. and Christine A. Bockoven in Winchester, Massachusetts. When he was six years old his family moved to Sahuarita, Arizona. When he was sixteen, he transferred from public high school to Luther Preparatory School in Watertown, Wisconsin. Upon graduation he attended college at Bethany Lutheran College, graduating in history/philosophy in May 2018. At Bethany he enjoyed studying languages, playing the organ, singing in the choir, and working various on-campus jobs. He began studies at Bethany Lutheran Theological Seminary in August 2018. He is married to his wife Katie of a little more than a year, who just gave birth to their firstborn daughter, Adeline, in May 2018. Katie is currently finishing up her final year of nursing school at Bethany College. In his free time, he enjoys spending time with his family, reading the news, and exercising. Abraham Faugstad was born to Dan and Julie (Sorenson) Faugstad and raised in Belview, Minnesota. He was homeschooled until eighth grade and then attended E.C.H.O. Charter School and Southwest Minnesota State University before starting at Bethany Lutheran College in Mankato, Minnesota. He graduated with a Bachelor of Arts degree in Chemistry and a minor in Mathematics in May 2017. At Bethany Lutheran College, he was involved with Student Senate, Bethany’s Organization of Student Scientists, choir, chamber orchestra, theater, intramural sports, and playing guitar and organ. 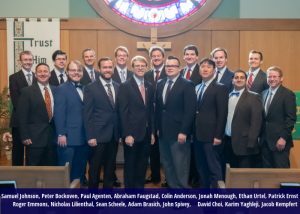 He enrolled at Bethany Lutheran Theological Seminary in 2018. Currently he works at Kato Cable in the Engineering department. Outside of his studying and work he enjoys physical exercise, music, and spending time with his family and wife, Elise. Nicholas Lilienthal was born to Rev. Gene and Cynthia Lilienthal in Fort Wayne, Indiana. He grew up in Luverne, Minnesota and Brownsburg, Indiana, attending Brownsburg High School before entering into Bethany Lutheran College in Mankato, Minnesota in the fall of 2011. He studied theatre and graduated in May of 2015. At Bethany, he was heavily involved in the theatre program, as well as the choir. After graduating from Bethany Lutheran College, he worked as an assistant manager in a tuxedo rental shop, a night stocker, a daytime stockman, and an assistant manager at a Dollar Tree. In the fall of 2016, he returned to Bethany to take Biblical Hebrew and Ancient Greek, and enrolled at Bethany Lutheran Theological Seminary in the fall of 2018. At present, he works at the Barnes and Noble Café when he is not studying in the seminary. Outside of class and work he spends his time reading and occasionally writing. Adam Brasich was raised in Madison, Wisconsin, and was confirmed at Resurrection Lutheran Church (WELS) in nearby Verona. He graduated from Wabash College in Crawfordsville, Indiana, where he majored in religion and minored in political science and Ancient Greek. He continued his education at Florida State University, where he earned a M.A. and Ph.D. in American religious history. Adam enrolled at Bethany Lutheran Theological Seminary in 2017 and is excited to train for the public ministry. When not studying or working, Adam enjoys singing, hiking, and visiting with his family and friends in Tennessee, Indiana, and Utah. Roger Emmons Jr. was born to Roger Emmons Sr. and Kay Emmons in Winona Minnesota. He attended Onalaska Luther High School, he graduated Winona State University with an Associates of Arts in June 1993, Troy State University with a Bachelors of Applied Science in Human Resource Management in December 2004, and Martin Luther College with a Seminary Certificate in May 2017. He is a retired infantryman of the United States Army. His military service was with the Minnesota National Guard from Nov 1984 to Jul 1993 and on active duty from July 1993 to February 2014. He is married to Tammi (Allison)Emmons of Peoria Illinois; they enjoy traveling to visit their five children Cassandra Emmons (Trempealeau Wisconsin), Stephanie Simmons (Flora Illinois), Cale Emmons (San Antonio Texas) Taylor Emmons (Fort Bliss Texas) Destini Ott (Osan Air Base South Korea) and their six grandchildren. Samuel Johnson was born to Dan and Emily Johnson and grew up in rural Nicollet, Minnesota. He was homeschooled through high school and then attended Bethany Lutheran College in Mankato, Minnesota. He majored in Music with an emphasis in piano performance, graduating in Spring 2016. At Bethany he was in concert choir, gave two piano recitals, and played in the honor recitals held each semester. He enrolled at Bethany Lutheran Theological Seminary in 2017. Presently he teaches piano lessons and plays for seminary chapel. His family includes his wife, Elisa, and their daughter, Tovah. He enjoys spending time with his family, playing piano, reading, and camping. Jonah Menough was born in June 1994 to Ronald and Kathleen Menough and raised in Hanover, Minnesota. He graduated from Buffalo High School and then began studying at Bethany Lutheran College in 2012. He received a Bachelor of Arts degree in Mathematics on May 2016. At Bethany, he both wrote for and designed the college newspaper, The Scroll. Additionally, he worked as a Math tutor, teacher’s aide, and cafeteria worker. He enrolled at Bethany Lutheran Theological Seminary in 2017 and is excited to learn more about God’s Word and how to best serve the Lord. Sean Scheele was born in Southern California but moved around a lot throughout his life. He also grew up in Michigan and Arizona. He attended California Baptist University where he studied theology and served on several missions teams. After Graduation he moved to the Middle East to teach ESL and when he returned back to the States he attended Phoenix Seminary. During his second year there he became a Lutheran and started attending Redeemer Lutheran Church in Scottsdale, AZ. He finished his M.A. in religious studies and moved to Mankato in May of 2016 to finish his language studies. He likes to woodwork and enjoys time with his wife and three children. David Choi was born and raised in north- eastern China, specifically in the Jilin province which shares a border with North Korea. He earned his bachelor’s degree in Communication from JiMei University, which is located in the southeastern part of China. He returned to Chang Chun City in his home province to study for his master’s degree, which he finished in 2013. After working for two years at a telecom company, he went to South Korea and became involved with Seoul Lutheran Church. The pastor there, the Rev. Young Ha Kim, encouraged him to pursue his interest in becoming a Lutheran pastor. He took classes at Asia Lutheran Seminary in Hong Kong before moving to America and enrolling at Bethany Lutheran Theological Seminary in September 2016. Jacob Kempfert was born in Water- town, WI to Lowell and Carol Kempfert. He attended Fox Valley Lutheran High School in Appleton, WI, where he was involved with band, choir, drama, and speech. He also started a support group for students struggling with depression and mental illness. He attended Bethany Lutheran College from 2003-2007, eventually graduating with a BA in English. He was active in the theatre and creative writing communities at Bethany, and served as an editor for the Inkwell literary magazine. At Bethany he met Anna Basel, and the two were married in 2011. He received an MA degree in literature and creative writing from the University of Maine in 2012. After graduate school, he and Anna taught English in South Korea for three years. Anna currently is a graduate student and teaching assistant in the English department at Minnesota State University – Mankato. Jacob’s older brother Ben is a WELS pastor at Grace Lutheran Church in Oronoco, MN, and his younger sister Zabet is an honors student and former squirrel colony intern at the University of Wisconsin – Oshkosh. John Spivey was born in Pensa-cola, FL in 1992 to John and Joan Spivey. During his adolescence, his family moved to Casa Grande, AZ south of the Phoenix metro. John Spivey graduated High School at Casa Grande Union High School and completed his Bachelor’s degree at the University of Arizona in Social, Behavioral, and Human Understanding. John met his wife Hannah in the Spring of 2013 and began attending Shepherd of the Hills Lutheran Church Tucson, AZ. They were married in December 2013 and he became a confirmed member in February 2014. The fall of 2014 John began his studies for the pastoral ministry by attending Martin Luther College in New Ulm, MN where he studied Greek, Latin, Hebrew, and Theology. John and Hannah were blessed with the birth of their daughter Aubrielle in July 2015. John honorably served in the U.S Army Reserves from 2011-2017 a. Hannah is currently working on her Master’s degree in harp performance at the University of Minnesota Twin Cities. John enrolled at Bethany Lutheran Theological Seminary in 2016. Ethan Urtel is the son of Gene and Jill Urtel, born July 1994. Raised in Brooklyn Center, Minnesota, he was homeschooled through high school. In his high school years he attended Youth Educated At Home Academy, and participated in PSEO classes there. He thoroughly enjoyed his four years at Bethany Lutheran College, receiving a Bachelor of Science degree in Sociology and minor in Religion in 2016. Highlights for him were choir, choraliers, and any opportunity to sing, from chapel to choir tour. He also spent time serving at the cafeteria, and hopes to do more serving through training at Bethany Lutheran Theological Seminary to share the good news of Jesus Christ to others. Karim Yaghleji was born to Fawzi and Amira on February 5, 1984 in Hassaka, Syria. He moved to Aleppo when he was 12 years old. He earned a Bachelor’s degree in English literature and a Master’s degree in Linguistics from Aleppo University, Syria. He taught English as a second language and English for specific purposes at Aleppo University for over 4 years. He was the head of the English department at United Nations, Syria before he moved to United States at the end of 2012. His parents and only sister, Antoinette, are still in Aleppo, Syria. Karim graduated from Martin Luther College with a seminary certificate and enrolled in Bethany Lutheran Seminary. He currently works for Multi-Language Publications as a translator, translating books and movies from English into Arabic for Arabic speakers. Karim was united in marriage with Anna Yaghleji. They are blessed with a little girl last July and called her “Amira Jade” after his mother’s name. Patrick Ernst was born to David and Sharon Ernst and raised in Shakopee, Minnesota. He attended Shakopee High School, Martin Luther College, and Normandale Community College before beginning study at Bethany Lutheran College in Mankato, Minnesota. He studied English and graduated in December 2015. At Bethany College, he was active in organ playing, choir, and PAMA student mentors. In addition, he was editor at the college’s literary magazine, Inkwell, a member of the English honor society, Sigma Tau Delta, and on staff in the English and German departments. He enrolled at Bethany Lutheran Theological Seminary in 2015. Currently he works as the seminary’s librarian and serves as the seminary’s organist and choir director. He teaches religion as an adjunct faculty member at Bethany Lutheran College and preaches often in area congregations. Outside of study and work he spends time with music, foreign languages, and running.